Dealing With the Elements – Dust, Bug Bites, Surfers Ear etc. Living in the tropics has its advantages but it also had its share of disadvantages that come along with the package. I don’t believe that there is such thing as a perfect place, and if there is by the time you get there it is no longer perfect. What I mean to say is that perfection is relative and is usually decided by the beholder, and their particular view or attitude that day. Attitudes can change, so can one’s opinion and one’s mind for that matter. It is good to change your mind, it reminds you that you are only human, a product of your surrounding and there is still so much more to learn. One thing that I have learned is that you can’t have good days without having bad days. You will never know what it is you should appreciate until you find out what it is you shouldn’t appreciate. I don’t mean to sound like a pessimist for I am very content, even more so with understanding. Unless this good and bad are a part of perfection I don’t believe that perfection is something that can be achieved in this life. So it is not going to be perfect and you don’t have to be perfect. What a relief. There are pros and cons to just about anything we run across in life and it is up the individual to decide how they are going to feel or react to the different situations they are presented with. Sure we are the authors of our own fate and can make radical decisions to give us the upper hand in this rat race, but it doesn’t matter where we go or what we do, we are still victims to our surroundings and how we perceive things. As for my family, we prefer the more natural environment, less buildings, less freeways, less corporations less choices and full-force marketing. We traded this off for more trees, more land, long pristine beaches and deep rivers. Along with this trade comes more dirt roads, which means more dust, more jungle which means more insects, more beaches which means more water related illnesses. We have learned from observing ourselves and others that some people just can’t get over the side effects of the way they are living their life. Sometimes these trials are too overwhelming and leave one constantly irritated and in a state of complaining and uneasiness. I think that one needs to be aware of what it is that they believe makes them happy. In order to get by, and remain somewhat sane you have to take the good, the bad and the ugly all in a stride and of coarse do what you can to limit the negative effects of the surroundings. For example we make sure that the AC in the car works, not because you can’t stand the heat, which is the case sometimes, but because you can keep the dust off of the kids when the vehicle is enclosed. Dust can have many harmful effects on the individual and kids are way more vulnerable than most healthy adults. To prevent skin problems, eye infections and respiratory problems we do what we can to limit our exposure to the dust as much as we can. Another thing that we do is keep a steady supply of bug spray on hand and sleep under a mosquito net. This isn’t going to keep you 100% safe but it will limit the amount of bites that you get. The truth of the matter is some people get way more effected by bug bites than others. When I was younger I use to get eaten up on a daily basis, now that I am older it doesn’t seem to happen as much. However, our three year old son on the other hand gets it pretty bad. We need to constantly keep an eye on him and his bites. There are natural remedies and plants that can be used to limit the amount of biting insects in your home plus we have also found that getting the house fumigated every few months is a big bonus. We keep an open mind about the insects and understand that we came to live in their world as much as they are coming to live in ours. We deal with them and keep a diligent eye out for the more harmful ones like centipedes and scorpions as well as carrier mosquitoes. 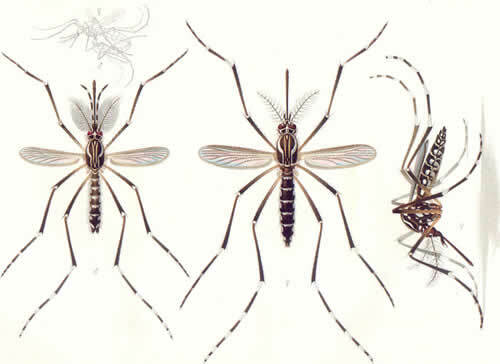 One particular type to be on the lookout for is the Aedes aegypti mosquitoes which hunt most actively at dawn and dusk, in shady areas, or when the weather is cool and cloudy. The dengue virus is spread by these guys and gals and this is something you want to try to avoid. Having been a surfer for over 30 years also has its share of advantages and disadvantages, some on the body and how it responds or evolves to the environment. Costa Rica has some great surf and beaches with warm tropical water and offshore waves. These conditions draw you to the water but can also be harmful to parts of your body if certain things are not looked after. Since I was child I have had problem with my ears. Once I became a teenager the problems went away until a year ago. I had a few bouts with swimmers ear from here to there but nothing too major. Recently I have been in the habit of wearing an earplug in my left ear especially in an attempt to limit the negative effects of surfers ear. According to Wikepedia Surfer’s ear is the common name for an exostosis or abnormal bone growth within the ear canal. Surfer’s ear is not the same as swimmer’s ear, although infection can result as a side effect. Basically in an attempt to protect your eardrum and inner ear an avid surfer’s ear canal will start growing new bones that eventually can shut the canal. 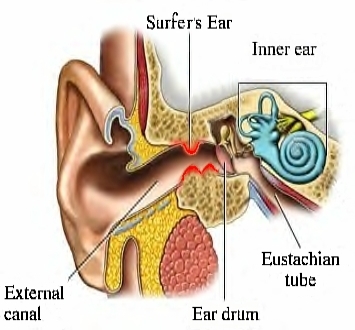 This effects the surfers hearing along with the ear canals ability to transfer fluid and clean itself out. Surfers ear is more prevalent in the ears of colder water surfers, but can be just as harmful to those in warm water conditions. I think that I developed mine surfing in southern California most of my life. The water in Huntington Beach and San Diego can get pretty cold, especially compared to Costa Rica. Once you have developed surfers ear, swimmers ear, which is an inflammation of the ear canal becomes very painful because there is no longer room for the inflammation to occur. Your ear is already 80% closed because of the surfers ear, then the inflammation from the swimmers ear nearly closed your ear canal 100% – making it impossible for water to exit your ear, or medicine to get in your ear. To prevent this from happening I keep a constant supply of earplugs. I have learned that they do go bad after a few uses. If water gets in, I need to clean it out with alcohol and vinegar as soon as I can. If any water sits in the ear it could start causing swimmer ear. Going with the punches is just a part of life, whether it is sitting in traffic on the way to the work or the monkeys waking you up at the crack of dawn, each person consciously decides how they are going to deal with it. The key is understanding that nothing will ever be perfect and the difference between a problem and a blessing is in how you decide to perceive it.